As promised, I present to you the Fake-Out-Eo. These are my take on the classic Oreo cookie. My twist (pardon the pun) is that these are stuffed cookies, not sandwich cookies. 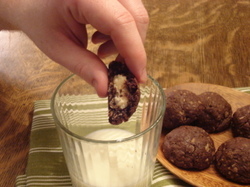 I use a combination of cream cheese, vanilla, sugar, and ground-up sugar wafer cookies to make the filling. It's seriously good. To quote our doorman and real-life cookie taster Jason, "These are ridiculous they're so good." As demonstrated by Jon, America's next top hand model, these chocolaty morsels are best when dunked in a glass of ice-cold milk. Just like you did with your Oreos when you were a kid...or still do today. 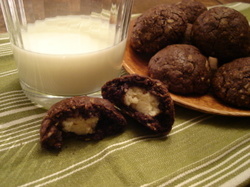 To achieve the rich, brownie-like texture and deep chocolate flavor, I use a quadruple shot of chocolate. Regular readers are familiar with my MO by now: cocoa powder, microplaned baker's chocolate, microplaned milk chocolate, and (drum roll please) ground-up Cocoa Pebbles cereal. Bake up a batch to share with mom this Sunday...but save a dozen--or two--for yourself. Makes about 4 dozen. Add the filling ingredients to a medium bowl and mix well. Set the mixture aside until step 7. Remove the filling mixture from the refrigerator and stuff each dough ball with 1/2 teaspoon of the mixture. Put the stuffed dough balls in the freezer for five minutes to firm up. These cookies look amazingly delicious!! I'd recognize the wonderful hands of your hand model anywhere! They do enhance the appeal of the cookie. These sound fantastic, thank you! Thanks, everyone. These are really good. And I say that as someone who isn't really a huge chocolate fan. These cookies won't stay around long. The stuffing process is easy once you get in a rhythm. The dough can get a little crumbly as time goes by because of all the chocolate. But don't worry...all the cookies turn out extremely moist, chocolaty, and brownie-like. You've really got to try them. OMG, these cookies are so delicious!! Thank you so much for "the list" I am going to try them all. Thanks, JC. I hope to start posting recipes and pics from earlier entries in the list. Hey JC, I did a cookie from earlier in the list week: the Juliana Skiffle...AKA ginger and lime. I think I might do the dulce de leche next. Stay tuned.